At yesterday's IEEE Computer Society's "Rock Stars of Mobile Cloud" event in Boston, John D. Halamka, CIO of the city's Beth Israel Deaconess Medical Center (BIDMC), spoke about how he and the hospital's medical staff are using Glass to, quite literally, save lives. "I was paged emergently to one of our resuscitation bays to take care of a patient who was having a massive brain bleed. One of the management priorities for brain bleeds is to quickly control blood pressure to slow down progression of the bleed. All he could tell us was that he had severe allergic reactions to blood pressure medications, but couldn't remember their names, but that it was all in the computer. "Unfortunately, this scenario is not unusual. Patients in extremis are often unable to provide information as they normally would. We must often assess and mitigate life threats before having fully reviewed a patient's previous history. Google Glass enabled me to view this patient's allergy information and current medication regimen without having to excuse myself to log in to a computer, or even lose eye contact. It turned out that he was also on blood thinners that needed to be emergently reversed. By having this information readily available at the bedside, we were able to quickly start both antihypertensive therapy and reversal medications for his blood thinners, treatments that if delayed could lead to permanent disability and even death. I believe the ability to access and confirm clinical information at the bedside is one of the strongest features of Google Glass." Halamka's telling of the story was a bit more dramatic -- for example, he had the doctor holding a syringe full of medicine that could have killed the patient, ready to inject it had he not received a notification via Glass about a serious allergy just in the nick of time. BIDMC began its Glass pilot on Dec. 17, 2013, with a set of four emergency physicians serving as testers. In January, 10 more BIDMC staffers started using Glass and sharing feedback. Halamka has been writing about his experience with Glass on his personal blog since last summer. But he mentioned a few interesting things yesterday that I hadn't heard before. Halamka and BIDMC dealt with the privacy implications by wiping out the Google software completely. 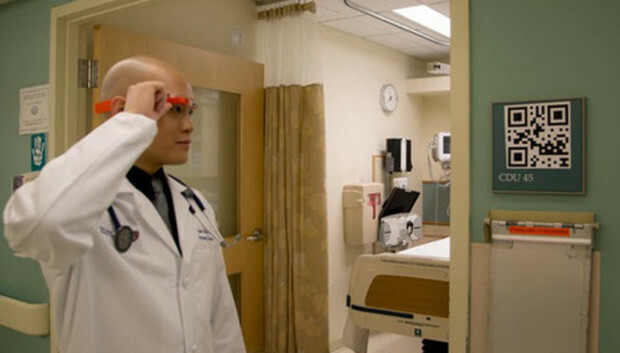 "There is no Google software on the 'BIDMC-branded' Google Glass," Halamka said. Halamka and his team worked with San-Francisco-based Wearable Intelligence to come up with a custom software interface and feature set. It only connects to the hospital's internal, firewall-protected Wi-Fi network. "Wearable Intelligence has designed a custom user interface to take advantage of the Glass unique features such as gestures (single tap, double tap, 1- and 2-finger swipes, etc. ), scrolling by looking up/down, camera to use QR codes, and voice commands. Information displays also needed to be simplified and re-organized. "We implemented real-time voice dictation of pages to staff members to facilitate communication among clinicians. "After several months of testing, we have deployed the product to clinical providers in the ED [emergency department] and are completing the first IRB [Institutional Review Board] approved study (to our knowledge) of the technology's impact on clinical medicine." Glass and other wearables offer clear advantages over smartphones and tablets, according to Halamka. "I don't have to grab the iPhone, I don't have to worry about infection spreading, it gives me alerts, [and when] I'm in the middle of one task, I can see other team member messages," he said. "I can collaborate with other doctors. This all makes good sense." Of course, Halamka has noticed room for improvement during his time with Glass, including the fact that the screen resolution of the tiny display is relatively low. (Glass display resolution is 640x360 pixels, far less than full HD.) But he also notes that most of the uses at BIDMC don't really require HD resolution. Gripes aside, Halamka is an outspoken proponent of Glass and wearable tech in healthcare. "We have had life-saving events because of wearable computing," Halamka said at the IEEE Computer Society event. "I believe wearable computing will replace tablet-based computing for many clinicians who need their hands free and instant access to information," he wrote in a March blog post.